Let your clients make a special wish with these mini glittery wishing jars protected by an angel. 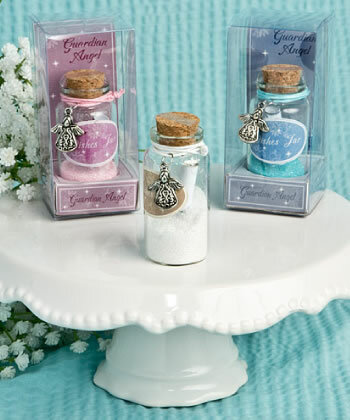 The mini glass jars offer 3 different colors of glitter; a stunning pink, a pure white and a bright blue. Each jar has a cork top and a metal angel dangling from a matching colored ribbon. Perfect for those hug-at-the-heart string gifts, these heavenly jars will offer many heart-warming moments! Gifts By Fashioncraft strive to bring you unique and different offerings for your shelves and these wishing jars are our latest find. Your clients will find it hard to leave your store without one! Each jar measures 2 1/4" x 1 1/4"
These angelic wishing jars are sure to bring a smile to your client's faces!